The Greater Hidden Hills Overlay District was signed into law Dec. 6, 2011. 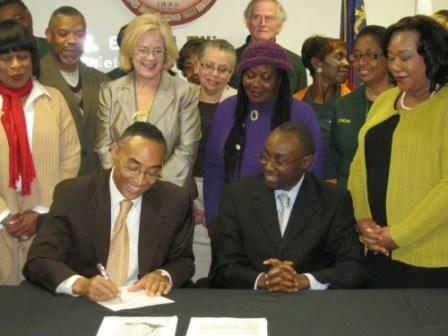 DeKalb County Chief Executive Officer Burrell Ellis and Board of Commissioners Presiding Officer Larry Johnson signed the document in front of two dozen elated residents. Improve connectivity on foot, by bike, and by motorized transit. Greater Hidden Hills Overlay Code was signed into law Dec. 6, 2011. The Greater Hidden Hills Overlay District is about four square miles. It is bordered by Covington Highway, S. Hairston Road, Redan Road, and Panola Road. More than one dozen neighborhoods participated in a five-year process to improve economic development. Overlay districts are a proven community redevelopment tool that have been used successfully all over the United States. The Great Hidden Hills district is DeKalb County’s 11th community to create a mixed-use overlay. The DeKalb County Department of Planning and Sustainability and the Atlanta Regional Commission provided essential services for this project.